While this book is a solid, well-researched rebuke to our times, its adversarial approach reduces the prospects of a receptive audience, says Magnus Goodlad. Capitalism vs the Climate is the subtitle for Naomi Klein's third book. The reader is not left in suspense for long as to which side the author will take, or about the style of her approach. The introduction places Sarah Palin in the capitalism corner, against the American Association for the Advancement of Science in the climate corner. Klein's latest book is broader in scope than her first two, No Logo, which set out in powerful terms the consequences and casualties of multinational corporate globalisation, and The Shock Doctrine, an equally strident assault on government use of political dislocation to introduce or accelerate market liberalism, but encounters many common foes and is written in a similarly iconoclastic style. 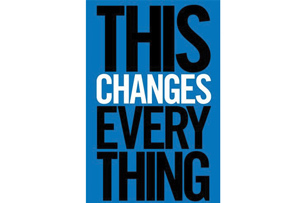 This Changes Everything is a thorough, well-researched and in many ways impressive book. Naomi Klein works at the Donna Tartt as opposed to the Barbara Taylor Bradford rate of literary output, with intervals of seven to eight years between publications. This is evident in the breadth of her coverage of a complex and important subject. The book has many sensible conclusions but I fear its impact will be lessened by its polemical, at times almost conspiracy theorist tone towards 'an elite minority that has a stranglehold over our economy, our political process and most of our major media outlets'. Frustration over inaction and short-termist 'quarterly capitalism', with decisions driven by the next quarterly earnings statement, although often entirely justified, reduces the impact of an otherwise powerful and well-argued message. Klein describes the 'denigration of collective action and veneration of the profit motive' as having 'infiltrated virtually every government on the planet, every media organisation, every university, our very souls'. This has more of the stern rebuke from the comfort of permanent opposition, the Tony Benn of later years, than the desire to engage constructively and work with such institutions on near-term achievable measures. Let not the best be the enemy of the good. She correctly challenges the relentless pursuit of GDP growth as an outmoded and increasingly dangerous way of measuring the relative strength of economies. She illustrates some of the harmful consequences, a theme also echoed by Al Gore in his equally compelling but far more measured treatise, The Future, released last year. This Changes Everything can appear unnecessarily one-sided, even beyond calling Sarah Palin as the star witness for capitalism. It fails, for instance, to address mistakes that have been made and lessons learned in the adoption of renewable power. These include the introduction of feed-in tariffs and other government support measures at levels that have led, in certain situations, to exceptional profits for renewable developers and operators at the expense of taxpayers. There are strong market motivations for government, business and consumers to use resources efficiently and to reduce waste. Water stress is affecting more and more people, and has dramatic health, financial and political implications. This can be mitigated through the development of widespread, lower-power desalination. Energy storage to manage renewable-generation overcapacity when the wind is blowing or the sun shining would increase adoption of these technologies and reduce power prices. These are two underinnovated areas, with the potential for fundamental positive climatic and economic impact and yet they are ignored in this book. The climate movement is most likely to succeed if it works with, rather than against, existing institutions. National budgetary constraints, hydrocarbon, automobile and related industries are not going to be torn up or abolished overnight. The emphasis of differences and the need to 'wage and win a battle of cultural world-views' makes for a more dramatic narrative but it's unlikely to convert the remaining sceptics or 'denialists'. Magnus Goodlad was head of renewables at Hermes GPE, a private equity fund manager, from 2010 until June 2014. He is now chief of staff to Lord Rothschild.